Six full size bars of our handmade goat milk soap wrapped in colorful cigar bands and stacked inside a tall Cellophane Bag, including our bestselling handmade goat milk soap scents of Patchouli Rose Cream, Patchouli Spearmint Cream, Orange Patchouli Cream, Cherry Patchouli Cream, Lavender Patchouli and Patchouli Shea Butter Hand Repair Soap. 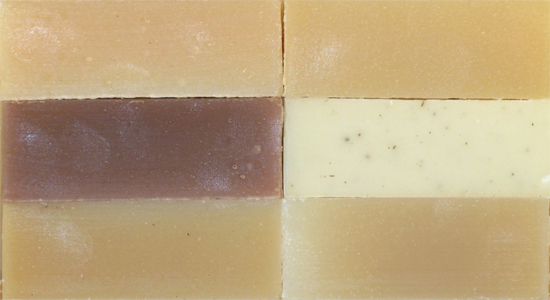 Our Patchouli Lovers Gift Soap Six Pack is a great gift for all skin types. We reserve the right to substitute as necessary, while keeping true to the theme of this scent group. Olive, Coconut, Palm and Castor Oils, Sodium Hydroxide or Lye, Mountain Spring Water and/or Goat Milk, Shea and/or Cocoa Butter, ground botanicals, and scent by Natural Essential Oil or artificial fragrances.